Any of us who have been out on the trail for more than a few days understand that backpacking is an endurance sport. Whatever your reasons for being out there, whatever your mindset or perspective regarding the activity, your body understands backpacking as an endurance activity. Most backpackers, and trainers who work with backpackers, focus on 5 primary fitness aspects: Aerobic Endurance, Anaerobic Endurance, Upper Body Strength, Lower Body Strength and Flexibility. 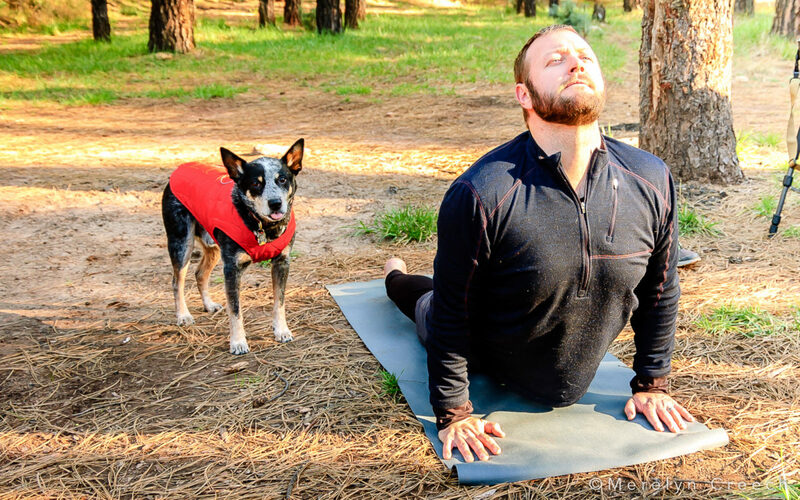 In his previous posts, Bob has focused on cardio training and weight training as it relates to hiking and backpacking…but I want to talk about the benefits of Yoga. Aerobic exercise is typically lower intensity, higher endurance type work and uses available oxygen in the bloodstream as fuel. Anaerobic exercise is higher-intensity, but significantly shorter bursts of activity usually recruiting much more overall muscle fiber and feeds primarily on glucose (and glycogen reserves). Both Aerobic and Anaerobic endurance rely on the body’s ability to access fuel (oxygen and glycogen) more effectively and to use the fuel more efficiently. The findings in these studies (referenced below) show that regular Yoga practice, when combined with proper Yogic breathing techniques, increases lung capacity and muscle efficiency. Allowing your body to not only store and deliver greater amounts of oxygen to the blood stream through more controlled and deliberate breathing, but also reduce the amount of glycogen your body needs in Anaerobic metabolism. In short, Yoga breathing adds fuel to the fire and your fire burns less fuel. 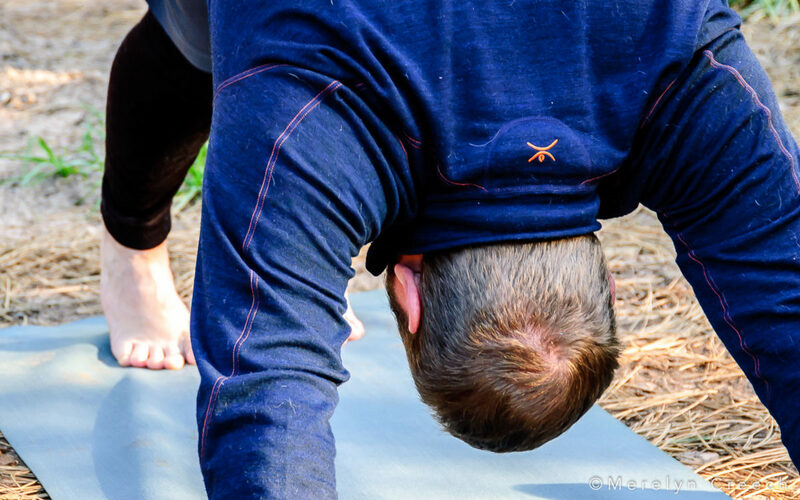 For improving endurance through better breathing, Horton suggests asanas that enhance both range of motion and lung capacity by opening the chest and rib cage. These include Urdhva Dhanurasana (Upward-Facing Bow Pose), Ustrasana (Camel Pose), Urdhva Mukha Svanasana (Upward-Facing Dog Pose), as well as Eka Pada Rajakapotasana (One-Legged Pigeon Pose). Upper and lower body strength is also highly important in endurance training. Not mentioned, but implied, is the development of a solid core. We are not talking about muscle development and growth necessarily, too much muscle can be a liability in endurance sports. Large amounts of muscle mass require large amounts of fuel and are, typically, less efficient. What we want to develop is the ability to recruit more muscle tissue in each movement. This delivers more power, with less muscle mass, utilizing less fuel. Body weight exercises are especially good when it comes to engaging more overall muscle during your workout. A simple push-up, as most of us know, not only works the chest and triceps but also works the legs, abs, back and shoulders. Further, performing asymmetrical push-ups throw your balance off and engage even more of your core muscles. Many Yoga postures are designed specifically to engage multiple muscle groups and fire your stabilizing muscles at the same time. Holding a typical standing pose like Warrior I or II, will engage almost every muscle in your body and holding the posture challenges the smaller core stabilizing muscles used to maintain your balance. This whole-body muscle recruitment, combined with the deep breathing, builds stronger, more efficient muscle tissue. When it comes to using yoga to improve muscle strength and endurance, Horton (mentioned above) recommends focusing on any asanas that promote a lengthening of muscles in the body, such as Parsvakonasana (Side Angle Pose), as well as stabilizing and strengthening poses that develop core strength, such as Navasana (Boat Pose). Yoga involves static-active stretching, making it a hybrid of the other forms of stretching. As in static stretching (whose proper technical name is static-passive stretching), you assume and hold positions in which certain muscles are lengthened. Like CR (Contract-relax), yoga also involves isometric contractions, but with a crucial difference: In CR, you contract and relax the same muscle in a coordinated sequence; in yoga, you hold one set of muscles in isometric contractions while relaxing and stretching the muscles opposite them. Balance is a particularly important asset in backpacking and is often overlooked in training. Good balance out on the trail can be the difference between an innocent stumble and a serious injury. I’ve seen many hikers/runners take a spill simply due to poor balance. Many of the standing postures in Yoga are performed on one leg (or some other isometric position) for the purpose of practicing balance. Yoga also teaches the mental side to maintaining good balance, achieving some standing postures takes great focus and control (Mindfullness). If you haven’t worked on your balance in a while, try a posture as basic as Vrksasana (Tree Pose)and see how long you can hold the pose. For most it’s a matter of seconds. When you feel comfortable balancing in Vrksasana, try to transition directly into one of the more challenging standing poses like Utthita Hasta Padangustasana (Extended Hand-To-Big-Toe Pose) or Natarajasana (Lord of the Dance Pose) without letting your raised foot touch the ground. The amazing thing about Yoga is, for all it’s fitness benefits, it’s also restorative. Many elite athletes and trainers have incorporated regular Yoga into their fitness training because it helps restore flexibility, speeds muscle recovery, reduces stress and helps prevent injury. If you haven’t incorporated Yoga into your training, you are missing out on an amazingly fruitful fitness resource.